It’s been revealed, via TV listings on Sky, that CITV will be broadcasting the seventeenth Pokemon movie, known as Pokemon XY: The Movie – Diance and The Cocoon of Destruction, as part of their Easter Bank-Holiday Weekend celebrations. The film, which will be aired at 9:35am on Saturday 4th April 2015 on CITV (Sky Channel 621, Freeview Channel 122) and then repeated on Monday 6th April at 1.55pm, is the first film based upon the Pokemon XY series; furthermore it is also the first Pokemon XY film to be broadcast on UK TV. In the underground Diamond Domain, where many Carbink live, the Mythical Pokémon Diancie serves as ruler. The Heart Diamond that sustains the land is beginning to fall apart, and Diancie is not yet strong enough to create a new one. While seeking help from the Legendary Pokémon Xerneas, Diancie encounters a group of thieves who want to take control of its diamond-producing power—and who awaken the Legendary Pokémon Yveltal from its cocoon in the process! 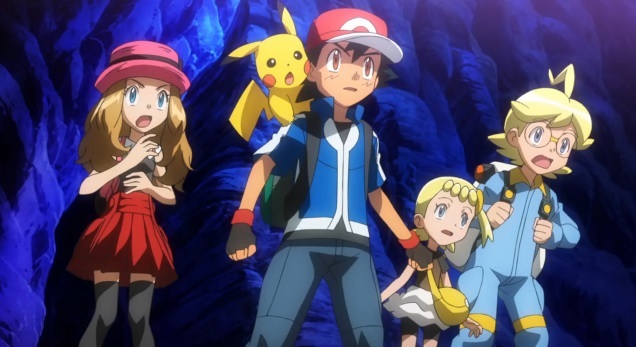 Can Ash and his friends help Diancie discover its true power, stop Yveltal’s rampage, and save the Diamond Domain? Pokemon XY: The Movie – Diance and The Cocoon of Destruction will be shown on CITV (Sky Channel 621, Freeview Channel 122) at 9:35am on Saturday 4th April 2015;, with the film being repeated again on Easter Monday at 1.55pm; if you think you’ll miss it then you may want to get those recorders at the ready. In addition to the film a special ‘prequel’ episode will be shown before it; a mini-episode which was previously available on the Pokemon TV App. We Assume that the film, along with its prequel episode, will also see a UK DVD release later in the year; although this has yet to be confirmed.